Kee Facts: The First Supercomputer Vs. 'The Desk Set' UNIVAC, short for Universal Automatic Computer, was put into service 60 years ago this week. NPR librarian Kee Malesky says librarians have a special relationship with electronic brains — thanks to a romantic comedy starring Katherine Hepburn and Spencer Tracy. Two men operate the enormous UNIVAC (UNIVersal Automatic Computer) in 1960. Now that we have handheld devices to do everything for us, it's hard to imagine the days when one computer filled a whole room. Decades before today's microprocessors, the first commercially available computer used magnetic tape and 5,600 vacuum tubes. It weighed thousands of pounds and measured 25 by 50 feet. 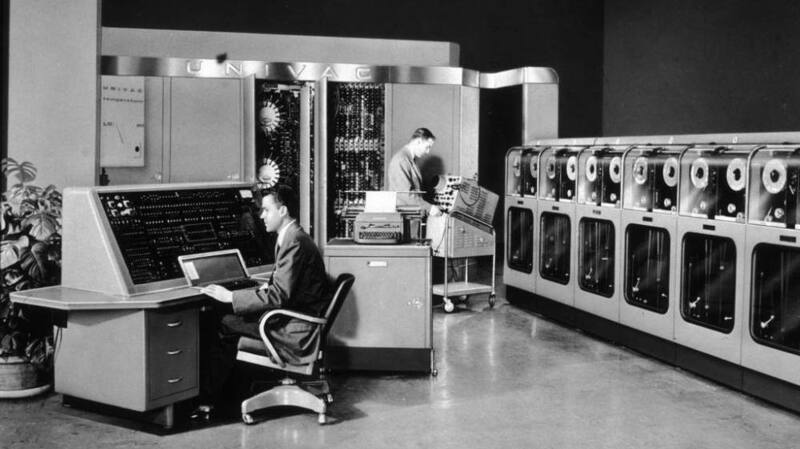 UNIVAC, short for Universal Automatic Computer, was put into service 60 years ago this week. Just 46 of them were built, costing about $1 million each. The Air Force, General Electric and Prudential Insurance were among the early adopters. One machine helped CBS News predict the outcome of the 1952 and 1956 presidential elections. It wasn't long after the introduction of UNIVAC that people started worrying these "electronic brains" would eliminate their jobs. In 1955, William Marchant wrote a play on that theme, called The Desk Set, pitting a fictional computer very much like UNIVAC against the reference library staff of a major radio-television network, otherwise known as "the desk set." In the end, the giant computer crashes and a librarian saves the day – with a hairpin. A Broadway success, the play was turned into a movie by screenwriters Phoebe and Henry Ephron — parents of writers Nora, Delia, Amy and Hallie Ephron — starring Katharine Hepburn and Spencer Tracy. Though this film isn't the best of their romantic comedies, it does have a place in the hearts of many librarians. Some years ago, I had the opportunity to interview one of the real librarians at CBS News who provided the inspiration for The Desk Set. She told me that Katharine Hepburn had come to visit them before filming began, to get a feel for reference library work. She picked up details of their daily routine, and sent the librarians flowers to thank them for their help. So this week, we celebrate the long and ever-evolving relationship between librarians and electronic brains.